Christmas is over and the leftovers have taken over my fridge. Mostly ham. I WAY overestimated how much ham I needed to bake. So I literally have about five pounds of smoked ham in my fridge that has got to be used up – I’m freezing some, but today, I made a big pot of potato soup. It is perfect for the weather we’re having – cold and rainy. And yes, this soup is creamy…but there’s no cream involved. Or milk, for that matter. 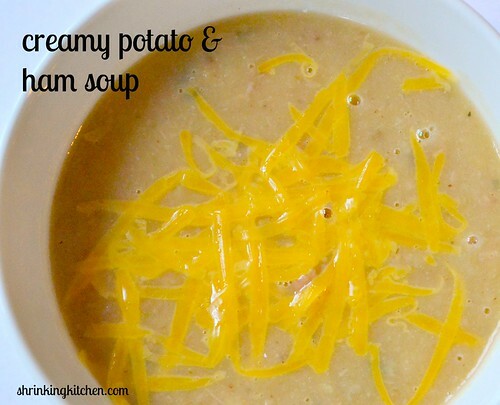 If you puree at the end, the soup is silky smooth and decadent without the added fat! Since this soup is so low in calories, feel free to garnish with a little shredded cheddar at the end. So good. Heat the olive oil in a large, heavy saucepan over medium high heat. Add the onion, celery and cauliflower. Saute for a few minutes, till the vegetables start to soften, then add the ham. Continue to saute the mixture for a minute or so longer. Add the potatoes, broth, water, pepper and rosemary and bring to a boil. Reduce heat and allow to simmer for at least thirty minutes. Remove the soup from the heat and blend with an immersion blender for a creamy texture. If you don't have an immersion blender, you can use a regular blender (work in small batches), or leave the soup chunky. Garnish with sharp shredded cheddar, if desired. I made this tonight and it was excellent! I had some ham leftover from NYE so this was a perfect way to use it. I can’t believe how creamy it got without any milk! I had to add more broth because it got too thick. Thanks! !